The Hillary House is of contextual significance in being the residence and place of practice of four prominent Aurora physicians, each of whom made a significant professional and social contribution to his community. The Aurora Historical Society continues to restore the building, ensuring its continued existence in a neighborhood that is slowly changing from its original roots. Situated on the west side of Yonge Street, north of the early business district, the residence evokes the prosperity of late nineteenth century Aurora. 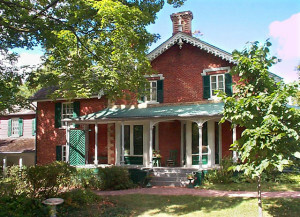 Built in 1862, Hillary House is recognized by the National Historic Sites and Monuments Board as one of Canada’s best examples of Gothic Revival architecture. It contains a significant collection of medical instruments, books, papers, household furnishings, and equipment dating from the early nineteenth to the late twentieth century and is open to the public as Hillary House, the Koffler Museum of Medicine. Hillary House is potentially among the foremost historic house museums in North America, combining architectural significance and the personal possessions of three generations of medical doctors who worked and lived there with their families. It is a window to a time of immense change, from the era of leeches and bleeding to the advent of penicillin, from a time of calling cards and private ballrooms to the arrival of the phonograph. Few museums can evoke the past and inexorable change so compellingly. To plan a visit or for more information click here.